Product prices and availability are accurate as of 2019-03-22 14:29:34 EDT and are subject to change. Any price and availability information displayed on http://www.amazon.com/ at the time of purchase will apply to the purchase of this product. Sparkles Make It Special 10 Yard 1-Row SS10 AB Crystal Rhinestone Trim is a popular premium flat rhinestone ribbon trim, also referred to as a rhinestone roll, rhinestone banding, or rhinestone wrap ribbon and can be used to enliven cake decorations, fashion clothing designs, DIY craft projects, home d'cor, and so much more. Chosen by event-planning professionals and cake decorators for its high-quality elegance and go-to affordability, the iridescent rhinestone ribbon features genuine premium SS10 AB rhinestones, each set in an individual attractive plastic setting. 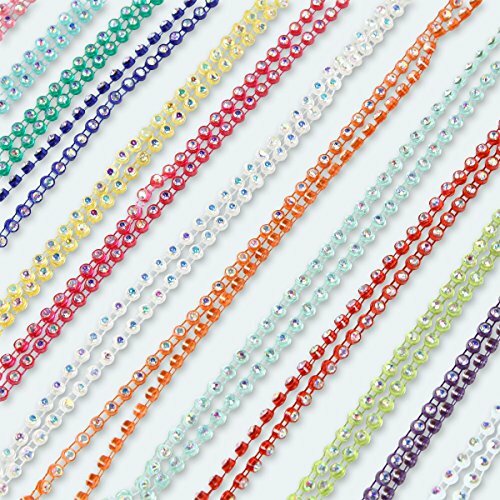 The AB rhinestones delight the eye with an added finish that brilliantly reflects a bright array of rainbow colors. 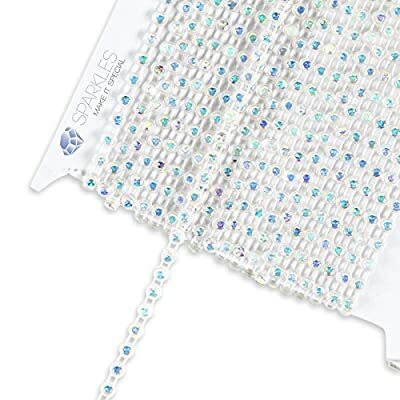 With each rhinestone approximately .11 inch (3 mm) wide (.15 inch or 4 mm including the plastic casing), you can easily cut, sew, glue, or hot glue this trim to create an elegant look anywhere, including special events like a wedding, baby shower, dinner party, or bridal shower. Whether a formal, lavish event or a relaxed affair, Sparkles Make It Special has your event (and your rhinestone trim needs) covered. 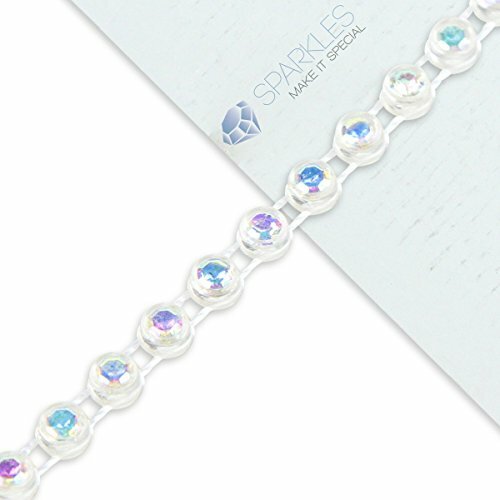 Brand-new 10 Yard SS10 AB Crystal Rhinestone Banding in an attractive Clear plastic setting. Perfect for decorating wedding cakes, birthday cakes, or simply as a decoration at your next special event, banquet, party, or reception. Perfect for craft projects too! This product features genuine premium SS10 AB rhinestones. The rhinestones are each set in individual Clear plastic casings. Each stone is approximately 3mm wide. In the plastic casing the width is approximately 4mm. Each 10 Yard strand is wrapped around cardboard to protect it while shipping. Product can be cut, sewn, glued and/or hot glued.